Comments: Fulham may have had a woeful few seasons, but poor Rotherham entered the game with a measly 17 points on the board and an impressive 29 losses in the process. A loss to Fulham would finally put this one legged horse out of its misery by confirming their relegation – the first of the season in England’s top 6 divisions. In rather better shape than Rotherham’s band of Sunday League impersonators were the pies on offer. 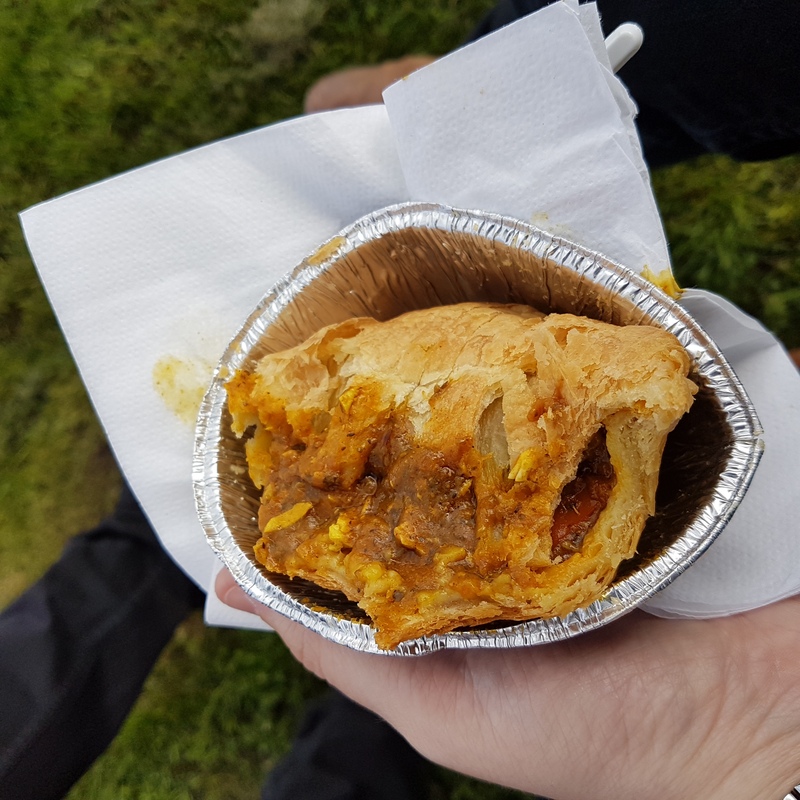 Food kiosks circled the ground meaning it was possible to enjoy a balti pie in the sun by the river adjacent to the ground, and in the process avoid the bun-fight of concourse eating. Revelling in this idyllic set-up, pie and pint in hand, I pondered whether Byron, Wordsworth and their airy-fairy cohort ever penned verses about picturesque pies outside football grounds. Anyway, enough about Romantic poets, what about the pie!? A regal, buoyant crust gave the balti an impressive initial appearance at odds with Rotherham’s deflated line-up. Ploughing through the mildly flaky roof with my trusty spork unearthed a reservoir of luminous curried chicken capable of irrecoverably staining my pristine white Fulham shirt. While generously portioned, the balti mix was flavoured with curry powder 101 and lacking a zesty oomph. 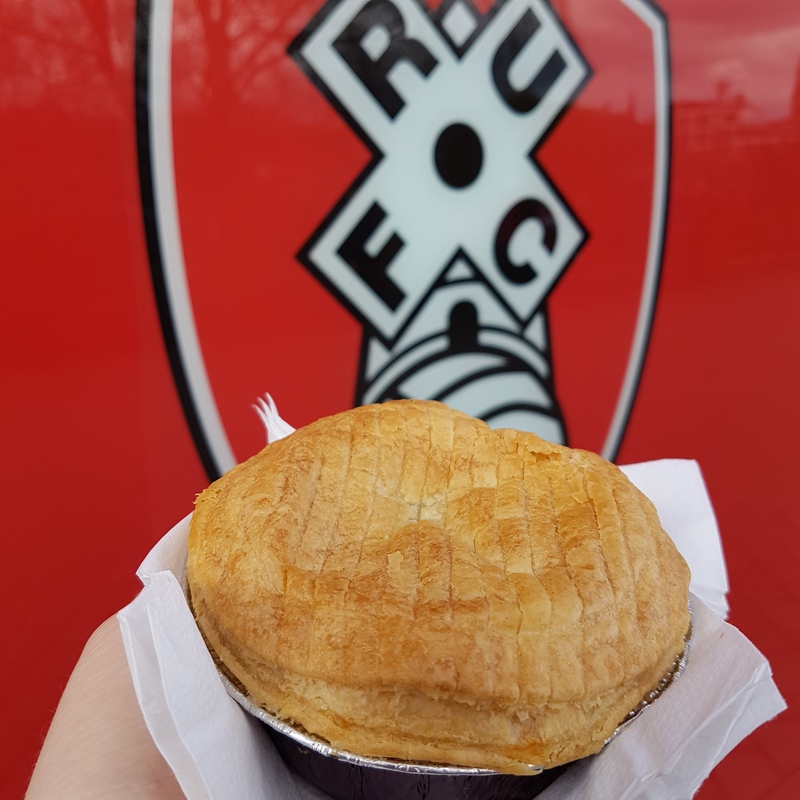 The base felt a tad undercooked, but Rotherham’s balti was a solid mid-table effort unlikely to trouble the play-offs, but safe from relegation. A bit like footballing purgatory then. Despite Rotherham’s team showing all the ability of an inanimate training ground free-kick wall, they valiantly battled off relegation until a lacklustre Fulham bundled in a brilliantly awful goal-mouth scramble filled with air kicks, balls in the face and flailing tackles. A 1 nil loss and relegation confirmed for Rotherham. In the words of Morrissey “to be finished, would be a relief”, I think Rotherham may well agree.